Sorry for all the bean recipes lately, but I made a big batch of my Easy Slow Cooker Black Beans recently so I’ve been thinking of all the different ways I can use them! This recipe was inspired by last night’s Grey Cup game. My hubbie was excited to watch, and I wanted to make something similar to what you’d eat while watching football, like nachos, but of course I had to make it healthy. For me what makes nachos so appealing are the different flavours and the textures; spicy, sweet, savoury, crunchy, and of course cheesey…so I tried to re-create all of those things with this burrito bowl. The best thing about bowls (my new favourite way to eat) is that you just layer on the ingredients, and than mix it all together for a big bowl of delicious flavours and textures. And for Jack, my two-year old, I simply took a few spoonfuls of the meat and bean mixture, some goat cheese and put it in between two whole-wheat tortillas. I pan-fried it for a few minutes to make a super easy quesadilla. Instead of traditional tortilla chips, I roasted sweet potatoes, which not only adds a healthy carb, but also some sweetness, which I find is so necessary to balance out spices like cumin, paprika and chilli powder. For some crunch, I added red pepper, and instead of sour cream I crumbled on creamy goat cheese and avocado. The result? A delicious nacho inspired Mexican Burrito Bowl that had my hubbie going in for seconds. Oh, and I made this all ahead of time while the kids napped so we came back from our afternoon outing, dinner just had to be assembled and reheated. Enjoy! Preheat oven to 425 F convection. Peel and chop sweet potatoes into small cubes. Add to bowl, toss with oil and season with pink salt. Spread onto large baking sheet and roast for 20 minutes, flipping after 10 minutes. While potatoes are cooking, chop onion, red pepper and cilantro. In a large frying pan, heat 2 tbsp. grapeseed oil on medium low and saute onions for a few minutes. Add ground beef and saute until just cooked, about 10 minutes. Add garlic, red pepper, beans, spices and salt and saute for 10 minutes. Remove from heat and cover until ready to serve. If making ahead of time, allow mixture to cool and refrigerate potatoes and beans in separate containers. Scoop in some sweet potatoes, the bean and beef mixture and than add your toppings: salsa, goat cheese, hot peppers, avocado and cilantro. Enjoy! *Because I was cooking for my hubbie I added ground beef, but you can totally make this recipe vegetarian. Tried this for lunch the other day and liked it so much that I’m thinking of meal prepping it for lunches next week! Any substitution recommendations for someone that’s not a huge fan of sweet potatoes? Hi Deb, so glad you enjoyed it! The sweet potato is the carb element so you can really substitute it for any healthy carb that you like. For example, butternut squash (you can buy frozen pre-cut and peeled), brown rice (you can cook this is coconut milk vs. water to make it a little sweeter) or quinoa. 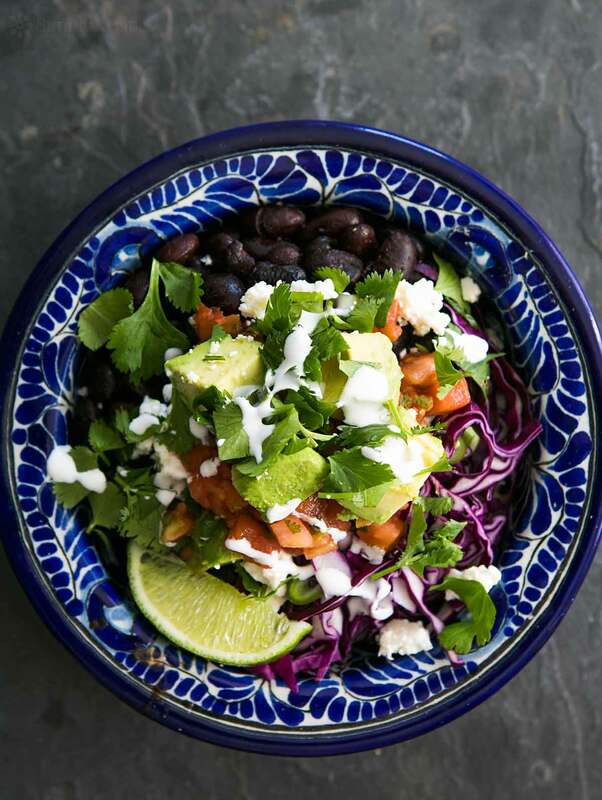 You can also just forgo the additional carb all together as this recipe has black beans, which also contain carbs along with protein and fibre. Enjoy!